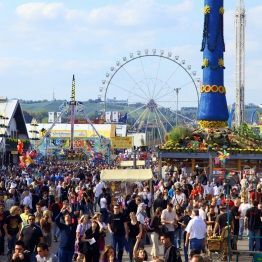 The Cannstatter Volksfest is easy to reach whether by car, coach, public transport or on foot. Bus stops and train stations are in the close proximity of the festival site. Also available for visitors is CCTV-secured bicycle and motorbike parking, guarded parking for cars and coaches and physically disabled parking right next to the festival site entrance. A taxi rank is also available in the immediate vicinity. 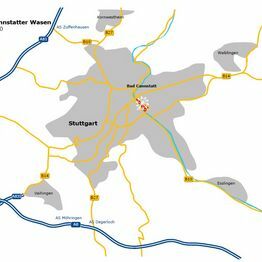 Stuttgart Airport is an approximately 25-kilometre drive away from the Cannstatter Wasen. Depending on the traffic, the journey will take will take about 30 to 40 minutes. 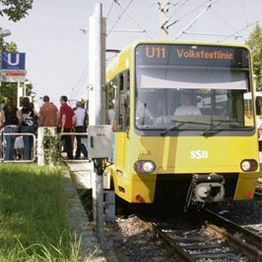 There is also a direct train service from the airport to the Volksfest. Taking either the S2 or S3 commuter trains from the “Flughafen/Messe“ station, alight at Bad Cannstatt. Take either the S1, S2 or S3 SBahn services or respectively the R1, R2, R3 or R8 trains to the Bad Cannstatt station. Following the signposts, the festival site is a 10-minute walk away. Limited car and coach parking is located in the immediate vicinity of the main entrance. It is signposted from all approach roads and stewards will direct you to available spaces. Parking is charged at 6 euro a day for cars and 12 euro for coaches. Also well-signposted are the disabled parking bays from which the festival site is easily accessible. Parking is free for holders of a disabled person’s ID card. Leave the A8 at the Stuttgart junction taking the exit signposted Vaihingen. Head towards Stuttgart-Zentrum on the A831 and then the B14. Continue on the B10/B14 from where the NeckarPark traffic control system will direct you to the parking areas. Leave the A8 at the Esslingen-Zentrum exit and take the B313. From there follow the B10 towards Stuttgart. 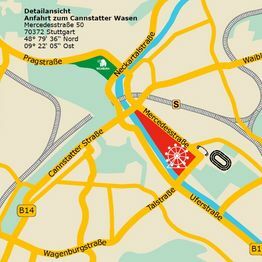 Now follow the NeckarPark traffic control system to the parking areas. Leave the A81 at the Zuffenhausen exit and take the B10 towards Stuttgart-Zentrum. Continue on the road heading for Stuttgart-Bad Cannstatt/Esslingen. From here the NeckarPark traffic control system will direct you to the parking areas. Leave the A81 at the Stuttgart junction taking the exit signposted Vaihingen. Head towards Stuttgart-Zentrum on the A831 and then the B14. Continue on the B10/B14 from where the NeckarPark traffic control system will direct you to the parking areas. Follow the B27 via Degerloch towards Stuttgart city centre. At Charlottenplatz turn right onto the B14 towards Fellbach/Waiblingen and continue on the road until the NeckarPark traffic control system directs you to the parking areas. Take the B27 past Ludwigsburg to the Pragsattel crossroads. From there take the B10 towards Esslingen and follow the road until the NeckarPark traffic control system directs you to the parking areas. Follow the B14 or B29 towards Stuttgart via the Kappelbergtunnel to the Benzstraße exit. 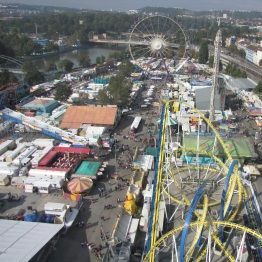 From here the NeckarPark traffic control system will direct you to the parking areas. Alternatively follow the B14 further towards Richtung Stuttgart and change to the B10. From here the NeckarPark traffic control system will direct you to the parking areas. Not possible to exit between 1.00 and 5.00 am. Not possible to exit between 1.00 and 4.30 am. The Stuttgart city centre has been a low-emission zone since 1 March 2008. Driving in the city is only possible in cars with a low-emission badge.